As low as 21% Savings! 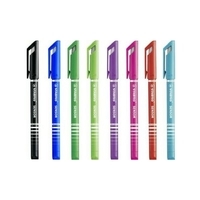 This unique fineliner, with a high-quality aluminum look and ventilated cap features a metal encased tip with patented micro cushioning that adjusts to the individual's writing pressure. It offers excellent writing comfort and the tip will not bend or break under increased and prolonged strain. It is well suited for use with a ruler. 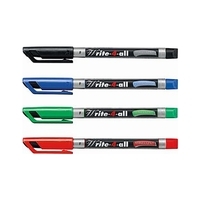 The wallet set contains one each of black, blue, green and red. Buy 25 Stabilo pens and get a FREE Stabilo Roll-up! Applies to 68 , 88, Point Visco, Write-4-All, Sensor Fineliners , and OHPen Universal. Limit 1 per customer, while supplies last. The More You Order... the More You Save! Enter quantities for each desired item(s) then click the 'Add Items to Cart' button at the bottom.